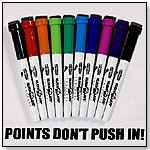 Kid-friendly dry erase markers with felt erasers that rinse with a simple solution of soap and water. Eight new colors. Our markers are compliant with CPSIA and are non/toxic-low odor. "Our marker tips don't push back up into the barrel when pressure is applied," Julia Rhodes, CEO of KleenSlate Concepts, told TDmonthly. Launch date: September 2011. New Deluxe Dry Erase Response Paddles with marker and eraser in handle for that all-in-one experience. Great for travel, working on homework and for family games.Environmentally friendly and clean up with a soft cloth and a simple solution of soap and water. Paddles Come in 8 colors. Launch date: September 2010. Awards: 2010 Kidlutions; 2008 Teachers Choice Award - Best in-classroom tools. This two-sided Dry Erase Paddle Board has one lined side and one blank side. It comes with an EZ pen and storage for the pen right in the handle. The durable, lightweight paddles may be used by both young students and adults. They are sold in a four-pack reusable mesh tote with an activity booklet and four extra dry erase markers/erasers. The boards can be cleaned with soap and water. Launch date: July 2009. 12 Plastic, double-sided hand-held white boards, each with integrated marker holder, 12 sm. markers & erasers, 4pack Lg. markers, activity booklet, and storage.